As it celebrates 7 million matches, the Web’s volunteering leader is once again changing how we discover great places to volunteer. VolunteerMatch's new home provides localized volunteer opportunities based on real time community needs. VolunteerMatch's new recommendations engine provides volunteer opportunities tailored to your interests. July 11,2013 /3BL Media/ - VolunteerMatch, the Web’s largest volunteer engagement network, is celebrating 7 million volunteer connections with the release this month of a new recommendations engine and an upgraded website design that makes it easier for individuals to find the perfect volunteer opportunity. Best known for the popular website, www.volunteermatch.org, VolunteerMatch pioneered the online recruitment of volunteers by developing the first national network of volunteer opportunities in 1998. Since then, the organization’s evolving approach to helping good people and good causes to connect has led the way in online engagement: first with ZIP code-based search (1998), keyword search (2003), mapping (2005), social media sharing (2008), skilled volunteering (2011), and now with profile-based recommendations. The recommendations engine is designed to make looking for volunteer opportunities easier and more compelling. Users can now update their profiles with their interests and skills to display on their profile page the best possible matches from VolunteerMatch’s database of more than 70,000 active volunteer opportunities. "Recommendations are the easiest and most powerful way for volunteers to find the perfect match," said Russ Nelson, VP of Products. "By allowing people to focus on what they care about, we can focus on delivering the best possible opportunities." In addition, the VolunteerMatch home page has been completely redesigned around the experience of the individual volunteer. To catalyze people to action, localization services now show actionable opportunities based on what VolunteerMatch already knows is going on in your community. The new home page also prominently shows virtual volunteer opportunities that can be accomplished remotely from work or home. The changes were released at the same time that the San Francisco-based nonprofit marked its 7 millionth volunteer connection. VolunteerMatch research shows that individuals who end up volunteering with a nonprofit through VolunteerMatch.org go on to serve an average of more than two years for that organization. This translates to more than $4.5 billion in comparative volunteering value generated for the independent sector by VolunteerMatch. More than 93,000 nonprofit organizations use the platform to engage volunteers. "We love what we do," said Greg Baldwin, president of VolunteerMatch. "It’s a privilege to help so many worthwhile organizations find the volunteers they need." The launch is the second major upgrade for VolunteerMatch in recent months. In November, the organization upgraded the design framework for its enterprise platform for leading corporations, campuses and brands. 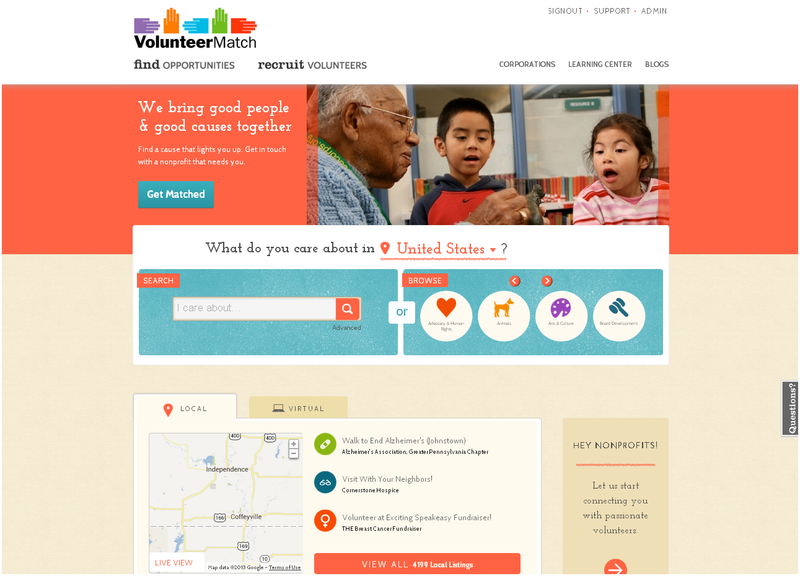 To see the new features, please visit: www.volunteermatch.org. VolunteerMatch is the Web's largest volunteer engagement network, with more than 93,000 participating nonprofits, 170 network partners and 10 million visitors each year. Founded in 1998, VolunteerMatch offers solutions to make it easier for individuals, nonprofits and companies to make a difference. Since its launch, VolunteerMatch has helped nonprofits attract more than $4.5 billion worth of volunteer services. VolunteerMatch is a two-time Webby Award winner, a Smithsonian inductee, and has been recognized for its work by The New York Times, Wall Street Journal, CNN, Time, Oprah Winfrey and Presidents Clinton and Bush. To learn more, visit www.volunteermatch.org.